The affordable and powerful entry-level laptop is aimed at students and recent graduates, and is intended to allow more Cambodians to have access to computers. The present spec for the first Koompi laptop is a 4 Core processor, with 8GB of RAM and 128GB of SSD storage space. The lightweight full metal 13.3 inch laptop weighs 1.4kg and has a 7-hour battery life. 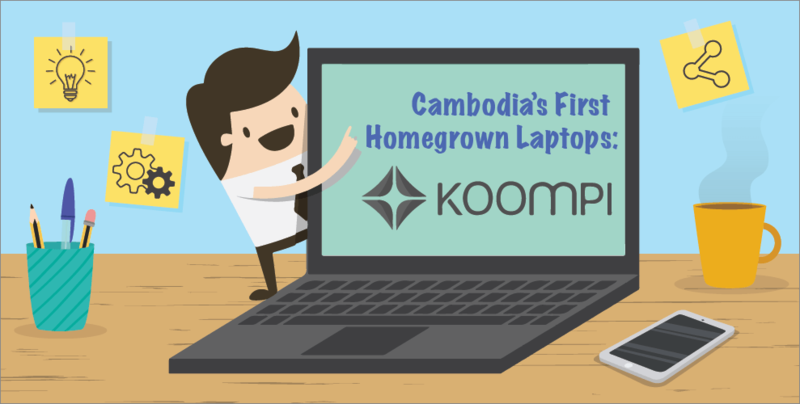 Geeks In Cambodia sat down with Rithy, co-founder of the SmallWorld co-working space and a prominent member of Cambodia’s tech scene, to better understand what the Koompi laptops encompass, and hear about his vision for Koompi’s future. The following interview has been edited for clarity, length and flow. What inspired the idea behind Koompi? Freedom was what inspired the starting of Koompi. Right now, while people might have access to computers they can use, these computers do not give them the freedom and capability to truly develop skills. For me, I learnt everything about computers by myself through using Linux. Linux has taught me how to think and empower me to make SmallWorld into what it is today. The mission of Koompi is to provide tools for the next generation of Engineers, Problem Solvers and Discoverers in Cambodia. What are some of the built-in apps / software available? Is it Linux based? To make it user-friendly for everyone, we have used a custom Linux-based operating system called KramaOS. Utilising this, we have included Office Suite as an open-source alternative to Microsoft software. There are communication channels like Telegram and Whatsapp available, Text Editor software for programmers, and a Brave web browser that utilises duckduckgo as a search engine. In keeping with our vision of freedom, people can install and use any applications or web browsers they want via the Linux Appstore. What are some key features of Koompi? We believe that the world is going digital. Jobs in the future will need people who know how to use computers and not just Microsoft Office alone. So we have included a wide variety of options to help people understand more about computers. There is a programming language environment pre-installed and pre-set for Python, Go, Bash and Clojure. We encourage people to use Python, a useful and universal (coding) language, and Clojure because we see it as the future. You don’t have to be a coder to use Koompi. There are web browsers, Office Suite, VLC to watch videos and the appstore has many other options for people. The main users of these laptops will be students in university. Are there any hopes of reducing the price of these laptops for school kids and people outside of Phnom Penh? Yes of course, we hope to reduce the price down to USD 250. However, because Koompi features a premium case and hardware, we have to order more than 20,000 units to bring the cost down, and this will require a lot of investment. How long did it take to attain the prototype it is today? In 2012, I started playing with old laptops and Raspberry Pi. Experiments using Raspberry Pi shows its limitations, so I went back to my old laptop and in early 2017, I wondered how Apple could run their laptops so smoothly? I figured that Mac software and hardware complemented one another, so I thought it could be a good challenge to build a laptop that complements the Linux software and hence, Koompi. What were some challenges faced when building the computer? The biggest obstacle for us was to learn everything about hardware and software. Not just programming alone but understanding the whole operating system and how both the hardware works and software integrates with one another. You have mentioned wanting to start building, or at least assembling Koompi computers in Cambodia in the near future. Can you tell us more about this? We have recently invested in a robotic startup where they are trained in electronics and robotic design here in Phnom Penh. We believe that they are the best candidate that can help us start designing. Hopefully, in two years time, we will have the capacity to come up with our small makerspace that designs and builds some specific hardware and eventually assemble laptops here. I look to bringing in different partners like Intel, Samsung, AMD and motherboards from different places to assemble here so that we not only create more jobs, but also provide a wholesome experience for technicians. We understand that you are launching a kickstarter-style programme where potential customers can pre-buy the laptops. What inspired you to do so? We reserved enough cash to produce 500 computers. However, we forgot about shipping costs etc and so we figured that if we can produce more computers, then it will be cheaper and save a lot of the overall shipment cost. Once people found out about the Koompi, they contacted us via Facebook to say they were willing to pay upfront as long as they are able to get a discount. So I thought it was a great idea to also give value to the people who supported us since the beginning, and decided to launch the kickstarter-style programme on our website. We call it a Money Back and Money Forward programme. Money back gives buyers the choice to get a USD 30 discount, and for those who can afford the full price and want to support the idea and concept the money forward option allows them to give USD 30 to selected socially responsible organisations. After filling in the order form on our website, we call up to answer any questions they might have about Koompi and the pre-order process. We have had more than 100 orders so far, without much marketing, which is really nice. We then give people ways to pay – this can be in cash at SmallWorld, and via cashless options as well, with Pi Pay being our official payment channel. We will do a big launch event in early September hopefully where we hope that everyone who has pre-ordered a laptop will come together and collect them with some kind of thank you gesture from us. As for mass-market, we are looking at late November right now. Do you have any plans to take Koompi internationally? I have received enquiries from the Philippines, Indonesia and Singapore from people who want to be distributors. We are looking to register Koompi in Singapore but I would love to as many people as possible in Cambodia using this tool to build their future. We are extremely excited to see what Koompi has in store for us, and what this new initiative will bring to Cambodia’s digital landscape. If you would like to learn more about Koompi or pre-order a laptop for yourself, you can check it out here!